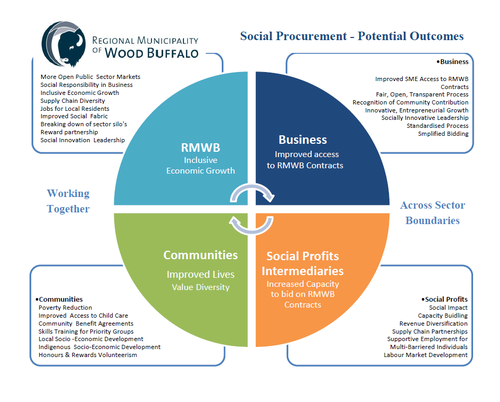 Procurement at the RMWB is being transformed to proactively seek social and economically sustainable benefits for the region and you are invited to take part in the planning. Working in partnership with The Chamber of Commerce; NAABA; Indigenous Communities; The Fort McMurray Construction Assn and with the Social Profit Sector, the RMWB is exploring ways to better leverage public sector procurement to improve lives in the region and to stimulate a more Inclusive Approach to Economic Development. What does this mean for Chamber Members? It could mean increased recognition in RMWB bid evaluation for the ways in which you already contribute to community. It could mean evaluation criteria that values and rewards local job creation, skills training, apprenticeships or work experience for barriered individuals; It could also mean smaller, more accessible contracts or bid criteria that values and rewards larger companies working to support the growth of other some of our smaller businesses. To ensure that the approach is built to specifically address the needs and priorities of our region, the RMWB is seeking your input. Chamber members are invited to participate by identifying an issue and then working to shape the development of a Social Procurement framework that will reward organisations working to address and overcome those issues.